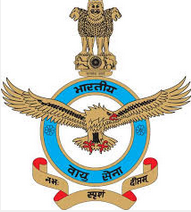 HQ Western Air Command, Indian Air Force (IAF) invites applications from Indian national eligible candidates for the following posts by the various Air Force stations/units. MTS : Matriculation pass or equivalent qualification from a recognized University or Board. Desirable - One year of experience as Watchman or Lasca; or Gestetner Operator or Mali from an Organization or Institute. Mess Staff : Matriculation pass or equivalent qualification from a recognized University or Board. Desirable - One year of experience as Waiter or Washer Up from an Organization or Institute. Safaiwala : Matriculation pass or equivalent qualification from a recognized University or Board. Pay Scale: ₹ 5200-20200 Grade Pay ₹ 1800/- for all posts. Selection Process : Written Examination. The Recruitment will be on the basis of written examination for all trades based on qualifications as indicated against the posts. The question paper will be provided in English and Hindi language. (1) Application as per given format duly typed in English/Hindi on foolscap paper, Recent photograph (Passport size 4.5 x 3.5 centimeters) duly self attested be pasted. (2) Self attested photocopies of certificate supporting Date of birth, Educational qualification, Experience etc. (3) Candidates belonging to SC/ST/OBC/PH/Ex-serviceman are to enclose self attested photocopies of certificate issued by the Competent authority supporting their category and reservation status. (4) Self addressed stamped envelope of size 24x11 Centimeters. (5) Any other documents supporting their candidature i.e. Sports/Cultural activities. (6) The envelope containing the application should be super scribed. "Application for the post of_____ In_____ Unit" Separate application for each post should be forwarded. The Last date for receipt of application is 30 days from the date of publication of this advertisement in Employment News (i.e. Last date may be 28/12/2015).